This is the bible study that I did during the summer. 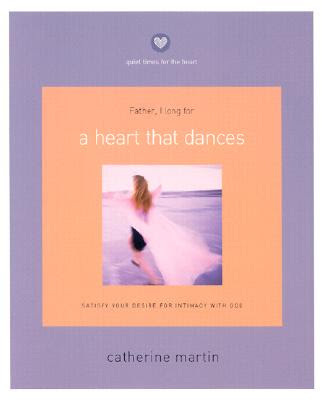 It's written by Catherine Martin who is founder and president of Quiet Time Ministries and is dedicated to teaching devotion to God and His Word. She challenges others to love God with all of one's heart, soul, mind and strength. Discover why God called David the man after His own heart. Find out why God allowed Moses to speak with him face to face. Lean about God's heart of love for the people of Israel. Reflect on the relationships Old Testament prophets had with God. A Heart That Dances will take you on a great adventure of intimacy with God. You will experience the firsthand joy of life with the Lord and the celebration it truly is. I am really glad that I did this study. I found myself truly wanting to dance with the Father as I drew closer and closer to Him. Oh, the joys of those who trust in Him." A Heart That Dances, what a beautiful Bible study that must have been and a true blessing. I desire nothing more than to be a Woman after God's own heart. I know I have told you many times before, but you truly have a way of presenting God's word that touches so deeply. I am one that is mighty thankful for your lovely blog. It was so nice to read your sweet comment left on my blog. :o) I have been pretty slow lately visiting all my favorite places but I am slowing down a bit and able to visit more. :o) You my friend enjoy a beautiful week.